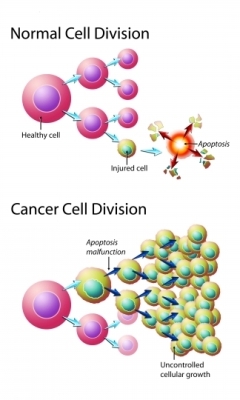 Cancer is a disease in which cells grow in an abnormal way. Normally, new cells develop in a controlled manner to replace old or damaged cells. With multiple myeloma, certain blood cells grow abnormally and cannot function properly. These cancer cells also crowd out normal cells, which can lead to problems with the immune system, oxygen delivery, and blood clotting. Platelets—Stop bleeding by clotting broken blood vessels in a chain of complex chemical reactions. White blood cells—Main line of defense for the body's immune system. Multiple myeloma affects a type of white blood cell called plasma cells. Normally the body can maintain a consistent number of plasma cells in the body by replacing old or damaged cells with new ones. With multiple myeloma, there is an excessive development of new unnecessary plasma cells and the plasma cells do not develop normally. The cancerous cells cannot perform normal tasks of the plasma cells, which weakens the immune system. At the same time, the excess, abnormal cells also crowd the bone marrow, making it difficult for any healthy blood cells to develop. Depending on the type of blood cells that are affected, low numbers of healthy blood cells can further weaken the immune system, interfere with oxygen delivery, or cause problems with blood clotting. 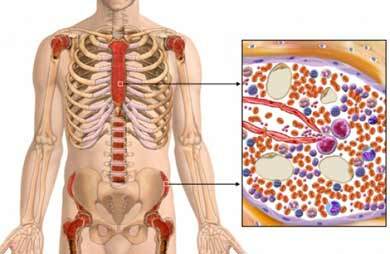 The cancerous plasma cells leave the bone marrow and circulate in the blood and lymph systems. The cells can collect in certain organs like the kidneys, heart, or bones and cause further damage there. The instruction for cell growth and cell death exists in the DNA of each cell. Multiple myeloma is the result of damage to DNA. The damage may be the result of genetics, environmental factors like radiation exposure, changes related to age, or a combination of these factors. It is possible for myeloma to present as one tumor in one location or be confined to one area around the tumor. However, almost all cases are considered multiple myeloma. That is, myeloma develops in the bone marrow and affects several areas of the body. Smoldering—Disease is present, but it progresses slowly without symptoms. Symptomatic—Disease is present and causing associated symptoms, such as bone or kidney disease, or is affecting healthy blood cell production and function. Multiple myeloma. Merck Manual Professional Version website. Available at: http://www.merckmanuals.com/professional/hematology-and-oncology/plasma-cell-disorders/multiple-myeloma. Updated September 2016. Accessed March 16, 2017. Myeloma. Leukemia & Lymphoma Society website. Available at: http://www.lls.org/disease-information/myeloma. Accessed March 16, 2017. What is multiple myeloma? American Cancer Society website. Available at: https://www.cancer.org/cancer/multiple-myeloma/about/what-is-multiple-myeloma.html. Updated January 19, 2016. Accessed March 16, 2017.